SHIPS OUT THE SAME DAY IN MOST CASES. 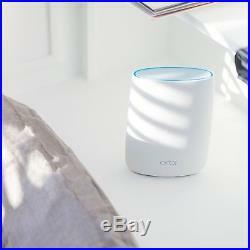 NETGEAR Orbi RBK50 HOME WI-FI MESH SYSTEM (AC3000 TRI-BAND WIFI), ROUTER & SATELLITE, WORKS WITH ALEXA & ECHO. UP TO 5,000 SQUARE FEET OF COVERAGE IN YOUR HOME. CAN BE EXPEDITED, IF NECESSARY. ONLY ONE SET LEFT AT THIS DISCOUNTED PRICE. THANKS FOR YOUR INTEREST. SEE FEATURES & SPECIFICATIONS BELOW. Whole Home Coverage – Upstairs and Downstairs. Eliminate deadzones throughout your whole home up to 5,000 square feet! Other types of WiFi equipment lose speed and range over large distances. Fast and reliable WiFi coverage. Connect all your WiFi devices without losing speeds! Freely roam around your home with uninterrupted streaming and downloading. Limit daily Internet time for websites, apps, and more. Set individual filter levels for family members to match their age and interests. 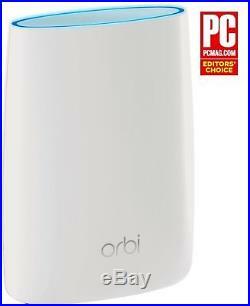 Each Orbi device comes with 4 Gigabit Ethernet ports. This is ideal to hard-wire entertainment centers, game systems, and home offices for fast Internet speeds. Expandable for more WiFi coverage. 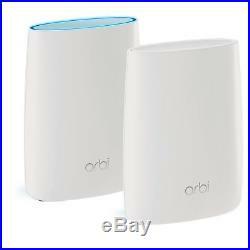 Easily add more Orbi satellites to your existing Orbi WiFi system for additional WiFi coverage. Easily create a Guest Network. Be a good host and have your guests experience the best WiFi in town. Easily and securely share your home or Guest WiFi credentials. FAST WHOLE HOME SYSTEM. 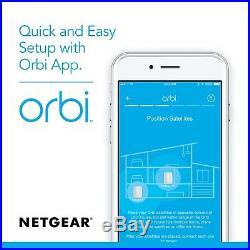 Bring fast, secure, and reliable internet to your entire family with the NETGEAR Orbi Home WiFi System. No more WiFi boosters or extenders necessary. The Orbi WiFi Router and Satellite extend high performance WiFi to your property from the basement to the backyard. The system smartly manages your WiFi so that each device’s access is optimized and never interrupted. Up to 5,000 SQUARE FEET OF COVERAGE. From the home office to the basement to the pool, this wireless internet system covers every inch of your home with a strong WiFi signal. Unlike router and repeater combinations, Orbi covers the whole home with a single WiFi network and name, enabling seamless indoor/outdoor and room-to-room connectivity. Award winning and patented Tri-Band Technology provides Orbi with a dedicated backhaul connection between the router and the satellite, so the system can manage multiple network connections without compromising speed. Watch movies and TV, play video games, download music, books, and more. QUICK & EASY SETUP. 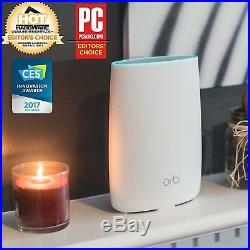 Selected as Editors Choice by PC Magazine, Orbi works with your current internet service provider and sets up in minutes right out of the box. No personal info, account creation, or hands required with the new Amazon Echo Alexa skill and our intuitive and preconfigured system. Allow guests the opportunity to access WiFi while protecting your network and password. Easily create a network to service visitors, and Orbi handles everything else. You’ll rest easy knowing that your information is safe from security breaches, viruses, malware, and network worms. COMPATIBLE WITH ALEXA & ECHO. Control your home network using voice commands. 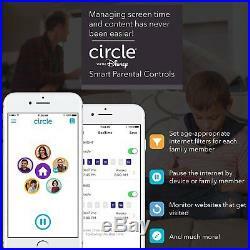 Now includes Circle with Disney Smart Parental Controls. Manage your family’s access to the internet by device, app or website. 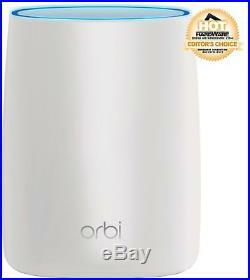 NETGEAR Orbi AC3000 Home WiFi System. WiFi Router and Satellite Extender – High-Performance Tri-Band Technology. 5,000 Square Foot Range. RBK50 (Router & Satellite), (2) AC Power Adapters, Quick Start Guide & (1) White Flat Cat 6 Ethernet Cable. Original Factory Box. 802.11bgn, 2.4 GHz Radio Frequency, 802.11 a/g/n/ac. Number of USB 2.0 Ports. PC;Android;Apple iOS. 6.7 x 3.1 x 8.9 inches. International Buyers – Please Note. In the item price. The item “NETGEAR Orbi RBK50 HOME WI-FI MESH SYSTEM (AC3000 TRI-BAND) ROUTER & SATELLITE” is in sale since Monday, September 17, 2018. This item is in the category “Computers/Tablets & Networking\Home Networking & Connectivity\Wireless Routers”. The seller is “pauliewalnuts212012″ and is located in Folsom, California. This item can be shipped to United States, Canada, United Kingdom, Denmark, Romania, Slovakia, Bulgaria, Czech republic, Finland, Hungary, Latvia, Lithuania, Malta, Estonia, Australia, Greece, Portugal, Cyprus, Slovenia, Japan, China, Sweden, South Korea, Taiwan, Belgium, France, Ireland, Netherlands, Poland, Spain, Italy, Germany, Singapore, Switzerland, Norway, Croatia, Brazil, Chile, Colombia.